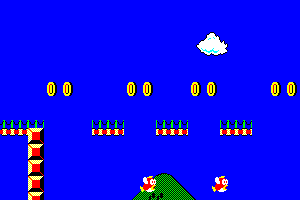 World 2 is the second world in the game Super Mario Bros. Special, located in the Mushroom Kingdom. The world is largely similar to World 2 from the original game, although there are major differences, mostly the levels being longer. The world also features the first underwater course in the game. World 2-1 The first course of World 2. The main enemies in this course are Goombas, Koopa Troopas, and Piranha Plants. This course resembles world 2-1 from Super Mario Bros., however, a few blocks are missing. World 2-2 The first underwater course in the game. It features some Cheep-cheeps and Bloobers. This course is identical to World 2-2 from Super Mario Bros., except there are slightly more Cheep-cheeps and it also contains a hidden area that is not present in its Super Mario Bros. counterpart. World 2-3 The first sky course in the game. It contains many jumping Cheep-cheeps. The trees in the course are smaller than they are in World 2-3 from Super Mario Bros., the course is longer, and the player is required to enter a Warp Pipe that leads to an underground area with the flagpole. World 2-4 The final course in World 2. It features many Fire-Bars. The course also features some added pipes as decoration.